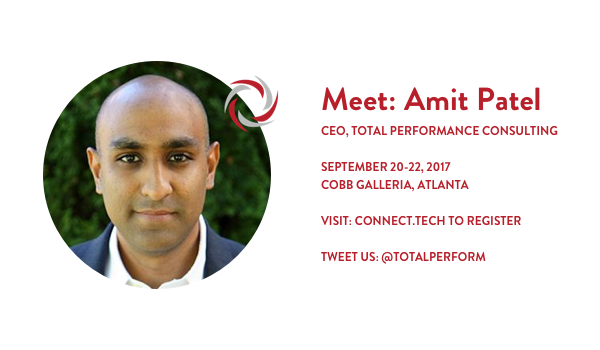 From September the 20th to the 22nd of 2017, Connect Tech will be holding their annual Web & Mobile Dev Conference in the Cobb Galleria Centre in Atlanta, Georgia, and our very own Amit Patel, CEO and Founder of Total Performance Consulting, will be presenting – “Integrating Performance Across the DevOps Lifecycle”. Amit will discuss ways in which performance engineers can, and must, work closely with DevOps to ensure performance testing is done at the right time, in the right environment and provides the right results. He will cover real world examples where we have helped our customers overcome significant challenges and be successful integrating performance testing across the DevOps lifecycle. Close to 1000 people are expected to attend Connect Tech and we hope to see many of our current and maybe a few soon-to-be customers there. If you see Amit, please say ‘hi’. We always love feedback on our presentations and hope to learn as much as we can while at Connect Tech 2017 in Atlanta. Software testing is taking on manic growth due to the rise of IoT devices, virtual reality and augmented reality, and new apps constantly being released as mobile continuously expands its boundaries. As Performance Engineers our responsibility is to keep up with all emerging technology whilst designing new testing tools and processes that ensure a great user experience. To keep up, automation testing has become a requisite and 21st century corporations are increasingly shifting towards Continuous Integration / Continuous Delivery. This shift is essential as DevOps teams aim to integrate quality assurance into each stage of development by load and performance testing earlier and more often in the SDLC (System Development Life Cycle). With this increasing pressure on DevOps teams the demand for software testing companies is at an all time high as we go deeper with industries who are beginning to “Shift Left” by testing earlier in their agile process and broader with the launch of new websites and applications everyday – we can’t even keep up on Product Hunt. Increasingly, corporations are turning to external resources and software testing experts to implement Test Automation and conduct exhaustive manual testing – Yes, there’s still room for human inference and intuition even as technology begins to simplify and make our software applications more efficient. Considering this multi-dimensional backdrop, it’s crucial for software testers to be up to date with latest trends, develop new skills, and incorporate new tools in to their wheelhouse. Both manual and automation knowledge is required, and as the demand gains ground on the offer, the power is with the “client” or buyer side, as they are able to choose who they work with based on knowledge, price, level of support, and timely delivery. A great way to stay up to date and also to develop your roots, trunks and branches in the Software Testing industry is to attend conferences, webinars and such. That’s where the magic happens! Every once in a while, the Software Testing community gets together to discuss issues, think together, grow together, and connect. This is what Connect Tech is all about!